Have you started to use PayPal to take online payment at your webShaper Stores? If not yet, it has never been a better time to start! webShaper is excited to offer you the opportunity to expand your business and grow your profits – through our partnership with PayPal. When you accept $500 USD or more in PayPal payments from now till September 30, 2010, you’ll receive $100 USD in your PayPal account. That means when your buyers pay you using PayPal, you will make even more money! So what are you waiting for? More details, T&C Please refer here. For webShaper Stores clients, How does it work? 1. Sign up for a PayPal Premier or Business account – it’s free and takes less than 60 seconds. 2. Log into PayPal and retrieve your API information: username, password, and signature. You can get your API information by clicking Profile > API Access > View API Certificate. 3. Log into webShaper > Payment. Activate either PayPal or PayPal Express Checkout (API is needed only for Express Checkout). However, as you can see, the report is pretty short and vague, it did not really say who’s charged, and what are the exact reasons they are charged. So we can understand that it has stirred up quite some concerns and we decide to seek advice with our lawyer friend and also special thanks to our business partner Optima for giving us the heads-up on MCMC reply on this topic!!! We refer to the recent report on TheStar where businesses who conduct online business did not registering with SSM (http://thestar.com.my/news/story.asp?file=%2F2010%2F7%2F20%2Fnation%2F20100720140310&sec=nation). We are web developer and have helped many of our customers develop e-commerce related website for our customers. All our customers are companies registered with SSM. Now that they sell their products & services online, can you please advice do we need to re-register with SSM and if so, how do we do it? As this is important, we appreciate your assistance on quick revert on this matter. Several media reports published recently on online business registration with SKMM, Malaysian Communications and Multimedia Commission (SKMM) would like to give clarification on this matter which has caused confusion to the members of the public. It was reported in the media that SKMM is monitoring online business to detect individuals and companies which conducted business illegally. The report was actually about Companies Commission of Malaysia (SSM) chasing after business entities operating on-line businesses which operate without proper business licenses. The Business Registration Act is not under MCMC’s purview. The Act is being enforced by SSM and any legal action against the 400 local online e-business operators in the last two years for not registering as business entities can only be taken by SSM. It is SSM that has actually taken action against these websites and not SKMM. SKMM was cited but we actually provide SSM with technical assistance to “detect individuals and companies which conducted business illegally” if required by SSM for their investigation. We hope the above clarifies on the matter. Then again, MCMC basically just say, no, we are not the one taking action (because this is NOT their responsibility), but SSM is. Conclusion? It really doesn’t say much. Damn! Q) Hi Chris, In referred to this act, does it mean that anyone, as long as you sell something (products or services), will need to register with SSM? A) First of all, SSM provides for registration of both the businesses (sole proprietorship and partnership) and the companies. In the context of your question, it is in relation to the registration of business. The simple answer is that, business registration is required for those businesses that are some what structured, premature and continuous in nature. For example, there is the existence of a business premises. There are exceptions under the Act, therefore not every selling and buying activities required registration with SSM. Q) What if you do not directly sell something, but instead make money via publishing (or aggregate) advertisement from Google Adsense (which most bloggers do). Do you still need to register with SSM? A) There is no specific provision in the Act to regulate this type of transaction. We are of the opinion that, as long as the content is developed on a personal basis and not collectively for gain, it does not fall into the jurisdiction of SSM. Q) If bloggers go to jail (for not registering themselves with SSM while making tons of ad money online), will they enjoy Free Wifi Services (so can continue to blog and earn ad money)? A) In the event the bloggers do go to jail, it is because of the violation of the law and no illegality shall be continue in any way whatsoever. However, this is an issue of compliance of law. Suppose if you have complied with the registration, you can legally make commercial gain. One point to note is that, a prison is not a commercial property. Therefore, operating commercial activities in the jail is still illegal. Q) How about government servants who are encouraged to take up part-time jobs and business (quite a number will consider make money online at places like mudah.my, lelong, ebay, lowyat forum or open a store with webShaper), are they required to register with SSM also? Any special discount for Government servants from SSM, in appreciate of their great service and sacrifice for the nation? A) As long as the services provided are of personal basis and ad hoc in nature, there is no need for registration with SSM. Q) Let’s put online aside, how about those people like char keo teow hawkers, stay-at-home mom selling cookies during raya, babysitter taking care of my kids, are they required to register with SSM too? A) For hawkers, by the wording of the Act, if the hawker stall is required to be licensed under any written law, ie: the local council licensed, it requires registration with SSM. On the other hand, for stay-at-home selling cookies and baby sitter, generally these activities are ad-hoc in nature; therefore does not need to be registered. However, if the baby-sitter service is a professional one, it must be registered with SSM. Q) What are the benefits of registering with SSM? A) Generally there are no clear benefits of registering with SSM besides legalising your business. A) No. by registration with SSM does not protect the consumers from scam. SSM only has minimal role in monitoring businesses. Business registration with SSM is only a fraction of the corporate governance under the Companies Act 1965. Q) Is it true when we said, “whatever illegal offline, is illegal online”? Eg gambling is illegal offline, thus you cannot conduct gambling business online. A) If any activity by its nature is illegal, it is illegal regardless online or offline. The question we are facing here is registration of business and compliance issue. So, your business must be a legal one and need to be registered with SSM. It is illegal because you fail to register it. Last but not least, one should not into the conclusion by merely reading the news. If you are serious about this issue, you should get an audience with SSM to clarify the situation and you should involve as many stakeholders as possible like the MCMC, MSC, MDEC and many more that are tasked to promote Malaysia as a centre of online excellence. Please understand our role of a lawyer as an interpreter of law while SSM are the enforcer. Furthermore, the compliance of law by registering your business with SSM is not hard and only at a nominal charge. Thereafter, you just need to renew your business yearly. Does this help? We sure hope it does. We certainly like to hear your opinions on this, faster post up your thoughts on comments field below! Our point of view (non-legal, of course) is pretty simple,what’s the first challenge when it comes to online business? Moreover, it doesn’t cost much to register a sole-proprietor and partnership, so, let’s just do it! And we are pretty sure government will be very supportive in encouraging people to setup online business (as long as it’s genuine) so it can help stir up new innovation which will eventually contribute to the country’s economy. Like us? Hate us? Nevermind, just don’t forget to join us at http://facebook.com/webShaper to stay updated on what’s new at e-commerce, payment, marketing tips and tricks and more! If you are still browsing the net and runs web application (like webShaper Stores) on Internet Explorer 6, it is really time to upgrade! Here are TOP 4 reasons why! 1) IE6 has serious CSS bugs (modern sites like webShaper Stores are pretty much CSS-Design Driven), thus it will have problem properly display the webStore layouts causing a mess out of your site. When Internet Explorer 6 was launched in 2001, it offered cutting–edge security – for the time. Since then, the Internet has evolved and the security features of Internet Explorer 6 have become outdated. With the latest state–of–the–art security features, Internet Explorer 8 is designed to cope with today’s modern cyber crime. In fact, research studies prove it. Safari 4’s 29% and Chrome’s 17%. don’t use an out–of–date browser. 3) Google is no longer supporting IE6, even Microsoft is calling IE6 a 9-years-old milk which you would not want to drink. Asking you to upgrade fast! 4) Some new cool features just wont’ work in IE6. As hard as we try to support as many browsers as we can (for both webShaper control panel and the template design), it is an almost impossible tasks recognizing different browsers runs on different engine, furthermore there’s an issue with backtrack support for old browsers. In view of the speed Internet advances, it’s no longer practical for us to do backward support for old browsers which ditched by the provider itself (in this case is Microsoft). We already phase-out all IE6 related support issues. It’s time to move on and retire the buggy browser. Haven’t done the upgrade yet? Do it Now! POS Malaysia recently just adjusted their Postage Tariff. If you are Malaysia merchant selling products online, chances are you are affected by the price adjustment. But come on… Postman starting salary is merely RM610 / month. (reportedly 19% below that of their government peers and is well below the poverty level). 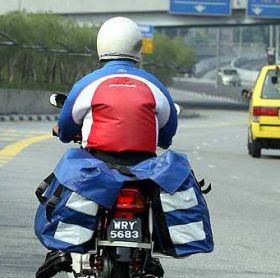 GOSH, don’t you think the poor guys delivering your mails and parcels deserve a better pay? (Yes! we think they do! so did he) I last seen an ad by Domino Pizzas promising salary up to RM1500 / month for pizza delivery boy. And i think you can get free pizza meals every days, which can save you quite a substantial amount. If all Posman know this, resign and start delivering pizzas (no offend to pizza lovers…), who is going to deliver my damn baby diapers ordered online? You !? So this is the official new price list shown on the official POS website. Smart, they guy who posted this did not put the before-adjusted price (so you are clueless and can’t really compare… ), either he is the master of psychology of pricing, or he just being plain lazy. Luckily we got this snatched form sinchew daily, it’s in chinese, so we added some label to guide you through.